I don't have anything new in print this month, but that doesn't mean I didn't spend quite a bit of time at my computer throughout the month of January. I cranked out quite a few words for my PTO volunteer positions, and I'm about to take on a pretty hefty editing job for my school district volunteer position. 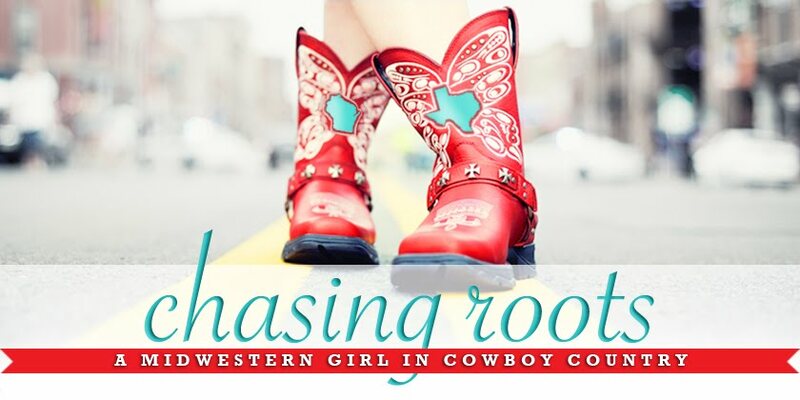 In between those projects and thanks to taking a small step back from Chasing Roots (making the slight adjustment from three posts a week to two posts a week), I felt able to tackle some new assignments I might have otherwise turned down. More to come! I finished - and LOVED - The Woman in the Window by A. J. Finn. I often share that while I enjoyed the middle and ending of a particular book, it started off rather slowly. That wasn't the case here, though - this mystery started off with a figurative bang and kept me hooked for every one of its 400 pages. A loosely related thought... Doesn't it seem odd that we are required to renew library cards in person and every year, but can renew driver's licenses online and every six years? I'm already SO over having to drive to another city to take care of my library needs. On the big screen, Hallie and I adored Mary Poppins Returns and both kids and I laughed our way through Small Foot. On the small screen, Tom and I watched Birdbox on Netflix and I fell in love with Marie Kondo's new show, also on Netflix. 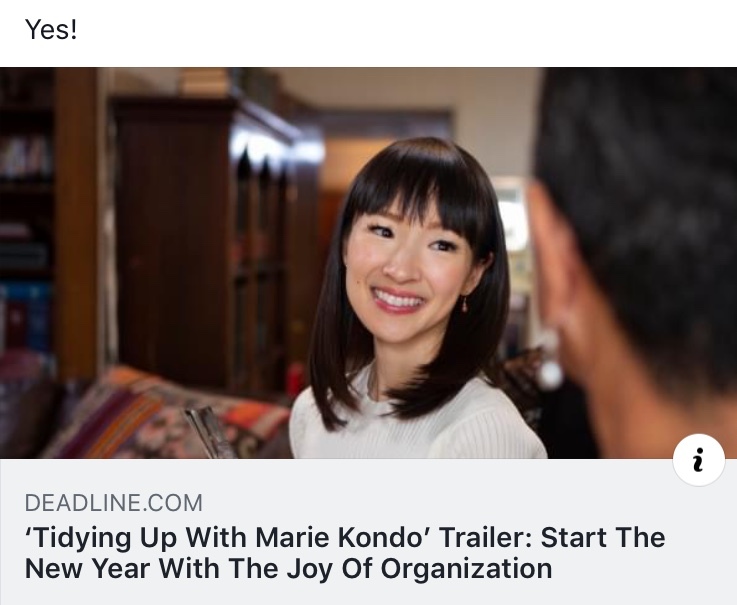 I knew about Marie Kondo previously - I haven't read her books but have been enjoying her YouTube videos for years - but watching her "live" has been delightful and inspiring. After a month of searching for a podcast that could keep me distracted while chugging away on the elliptical machine, I finally found one: Up and Vanished by Tenderfoot TV. The subject matter is engaging, and I enjoy the creator/host's style and the voice of the creator/host's best friend, Rob, who pops on every now and again to tell the most dramatic parts of the story. 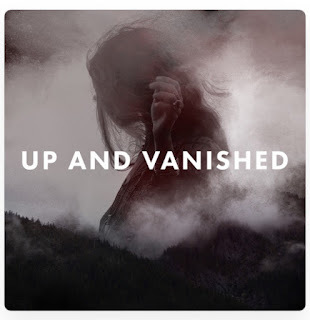 If you like Serial or Criminal, give Up and Vanished a try! After a couple of weeks of watching - somewhat helplessly - Hallie struggle with bedtime and separation anxiety, I brought in the big guns: my 40-year-old Winnie the Pooh. I slept with Winnie the Pooh tucked under my left arm from the time I received him as a gift (when I was a baby and in the hospital after my parents and I were in a car accident) until the eve of my wedding, and he never let me down. I can only hope he gives Hallie the same peace of mind he gave me on the nights I struggled. Even though he has taken at least one dose of peanuts every single day for nearly a year, Will still has trouble remembering that he has to take at least one dose of peanuts every single day. What I wouldn't give to better understand how the brain of a 12-year-old boy works... The "peanut alarm" on my phone goes off once every afternoon and then again every evening as a back-up, but this system puts the "burden" of maintaining Will's peanut desensitization on me, rather than on him. And while it makes sense that this responsibility and commitment to Will's health fall on both of us now, eventually we need to transition to it falling on him with me as a back-up and then falling solely on him. That process began with a brightly-colored, labeled-with-the-days-of-the-week, peanut (pill) container. Will fills each compartment with 12 peanuts on Sunday, and then we leave the container on an otherwise clear counter so it can remind him to take his peanuts. This "tool" didn't immediately solve Will's memory problems, but it is certainly a step in the right direction! Oh, and I highly recommend the container - it's fun, sturdy, and easy to use. I LOVE these new earrings my parents gave me for Christmas - gorgeous, right? The yellow stone on the bottom is my November birthstone, topaz. As a little girl I hated my birthstone, but as I've grown up it's grown on me. Also on a jewelry note... Back in November I lost a bag in which I had tucked away a few of my favorite jewelry pieces, I believe for travel. I searched my house from top to bottom, checked in with the lost and found at my gym, asked my mom and sister to check their houses...but I couldn't find the bag anywhere and was heartbroken. Well. Earlier this month and while putting away our luggage, I slid my hand down into an outside pocket of Hallie's suitcase and bumped into a bulge. There was nothing in the pocket itself, but I discovered a tear in the pocket's lining and when I shoved my hand through and behind the tear, I found my jewelry bag. I have absolutely no idea how it ended up in that hidden spot, but I am so grateful it turned up and that I can wear all of those pieces again! Gingerbread Cake When I was a little girl, my mom and I used to regularly bake gingerbread cake using a boxed mix. When Duncan Hines or Betty Crocker or Pillsbury stopped making the mix, we stopped making gingerbread cake, and it didn't occur to me until this past Christmas that I could make gingerbread cake without a mix. Over winter break I started searching for a winning recipe and eventually gave this one a try; I actually followed the recipe exactly (I usually cut the sugar, sometimes by almost half) and I'm glad I did, because this gingerbread cake was perfect. It took me back to my childhood and reminded me of how much fun I used to have baking with my mom. Beer Can Chicken I didn't actually cook beer can chicken, but Tom did, after receiving a beer can chicken roasting rack for Christmas. I can't find the exact apparatus Tom used, but I linked to a simple, affordable, and well-rated one here. Give it a try - easy process, delicious result! These are all pretty good ways to start the day. Watch him listen to her. How was your January? Anything new or fun to share?